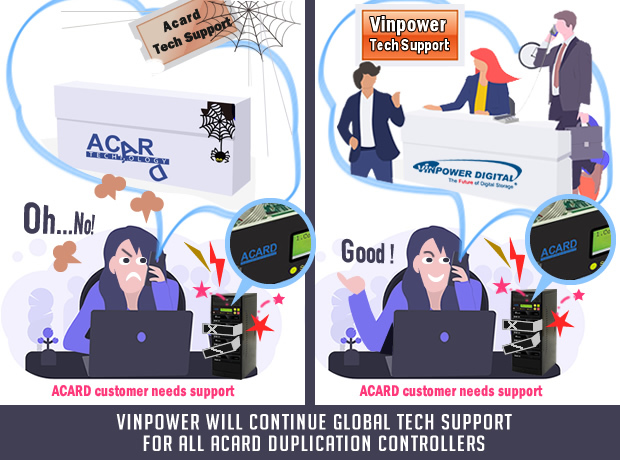 Acquiring ACARD’s technology, not only allows Vinpower to develop newer and more advanced duplication products moving forward, but it also allows us to continue supporting ACARD’s extensive customer base with tech support. Vinpower has the knowhow and continued firmware updates that will allow us to provide both in warranty and out of warranty support to all of ACARD’s previous customer base. If you were an ACARD distributor, you don’t have to ditch your existing customer base or existing inventory because you feel there won’t be any support moving forward. Likewise, as an end user with ACARD duplicators, you no longer need to feel abandoned when you encounter troubles with your controller. With Vinpower’s extensive knowledge of the duplication market and incorporating the acquisition of ACARD’s technology, we’ll be able to provide full support toward previous and current ACARD duplication hardware. Whether you purchased the ACARD product a few months ago or a few years ago, Vinpower can assist you. For more details about this product and support or any of Vinpower’s full product line, please visit our website, www.vinpowerdigital.com or contact a Vinpower representative in your region.